Tapped out with traditional typing? This new wearable might provide a situational solution. I’m a bit of a fussy writer. Sometimes I even find the mere sight of my words dropping across the screen as I write discouraging and intimidating, so I’ll drop a sheet of paper on my MacBook screen to keep from seeing what I’m writing. I’m thus always hunting for something that removes this frustration from the process. 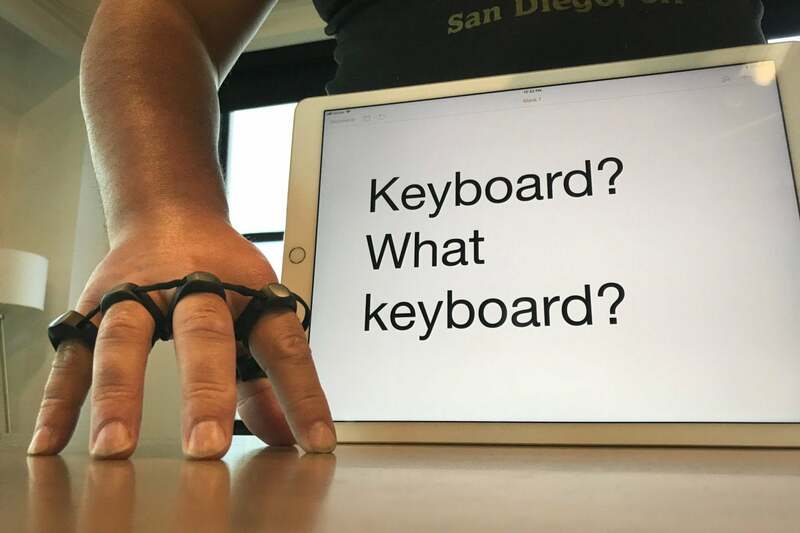 Imagine, then, my curiosity when I was told about Tap, a Bluetooth "wearable mouse and keyboard" that lets you "type" on iPhones and iPads (and Android devices) without touching a keyboard or touchscreen. Instead, it uses a system of finger taps from a single hand that works with varying degrees of success on any surface. It looks a bit like cyberpunk brass knuckles, or perhaps a minimalist 21st-century update to the Nintendo Power Glove. And somehow, unlike similarly ambitious devices like the Google Glass, the $150 device even looks kind of cool. 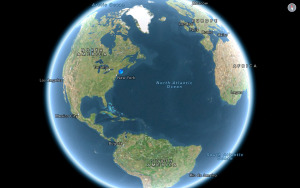 The mouse feature works by sliding your thumb along a surface. Too bad we can't use it on iDevices. Tap co-founder Sabrina Kemeny demonstrated the Tap while attending the Game Developers Conference here in San Francisco. It’s a testament to how well she feels the device works that she evaded telling me how to use it directly; instead, she watched as I opened the box, slipped it on, and learned to type by making gestures alone by following the instructions in the TapGenius app. Jony Ive, Apple’s design guru, might be proud. It’s a little like learning a new language, and, in fact, Kemeny tells me the Tap’s a bit of a hit among the blind, who find it speedier and less cumbersome than using a Braille keyboard. It’s especially useful in this age of text messages, as it allows them to join in the conversations with little awkwardness. But it’s a language I learned quickly. Even under the pressure of sitting in a tiny room with Kemeny and two Tap team members watching in silence, I quickly learned the rudiments thanks to a game-like tutorial that drops letters on the screen and prompts me to use the gestures to type them. It’s a little like Guitar Hero, yet I found myself playing it fine on surfaces ranging from kitchen counters the fabric of my blue jeans. There's even a little Raffi-like jingle to accompany this. The vowels correspond to taps of my hand’s five fingers, so A, E, I, O, and U are mapped from the thumb to the pinky. Want to type a space? Tap with all five fingers at once. A period? Tap with all five fingers twice. Consonants get a little more tricky, with S being mapped to a simultaneous tap of the index and pinky fingers and an exclamation point being tied to two taps of the index finger. Before 15 minutes had gone by, I was already tapping out small notes in iA Writer and Messages on my iPad Pro. Given a week of practice, I don’t think it’s much of a stretch to say I could tap out this whole article. Meanwhile, I'm still struggling to remember the strokes for the Japanese characters I started learning two months ago. 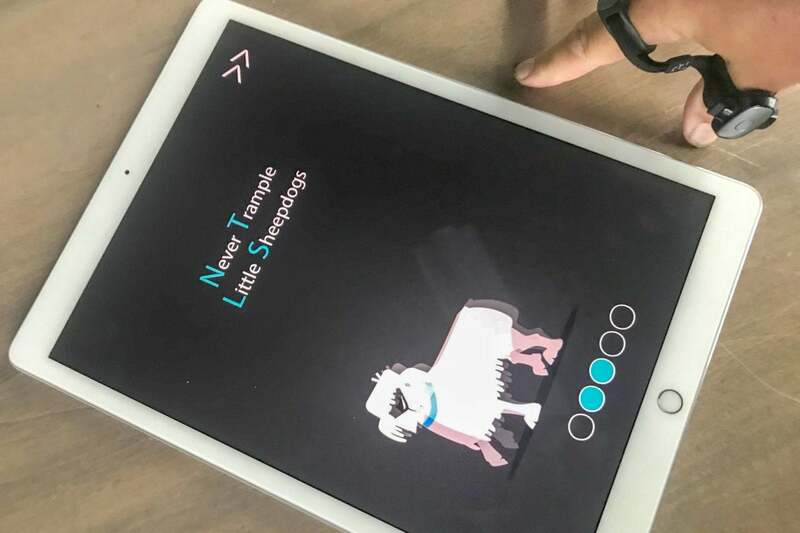 Tap had game design in mind as a tool for learning from the beginning, said Kemeny. It’s thus not surprising that the Tap doubles as a unique game controller, which I discovered by playing their game TapTapbunny on my iPad. 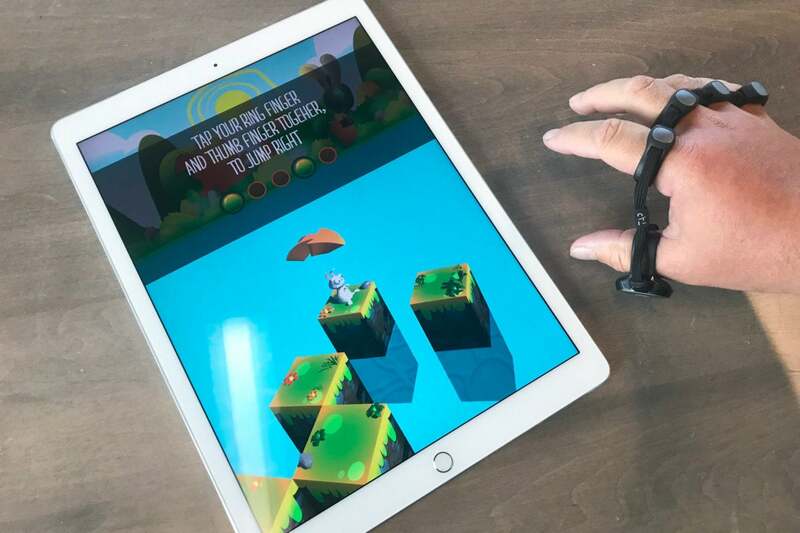 Playing as a rabbit trying to get to a giant carrot while hopping across a lake on squares of land that disappeared beneath him, I move forward by tapping with my middle finger and move right by tapping with my ring finger. I tapped my ring finger and my thumb at the same time to jump across gaps to the right. As with typing, I picked this all up pretty quickly. 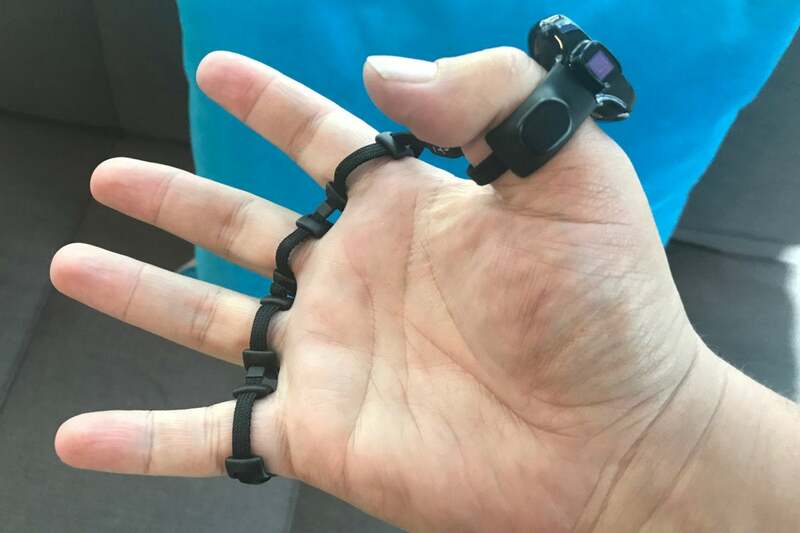 It’s also apparently a godsend in virtual reality, as it lets users type with headsets on without fumbling for physical keyboards they can’t see or struggling with virtual ones. I turned the tables on Kemeny. I wanted to see a pro. I asked if she, being someone who’d used Tap for months and years, could show me how well she types with the device. This, I told myself, would be the true test of Tap’s effectiveness. And wonder of wonders, she whipped out her phone, showed me the blank note page on her iPhone, and commenced to type out a short message that was slowed only by her indecisiveness over what to say. Even more remarkably, she did this with her phone turned away from her toward me. 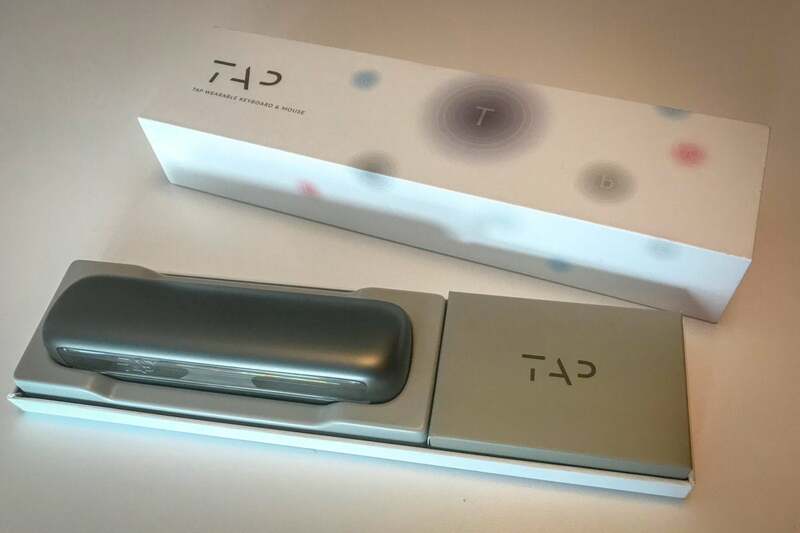 Tap technically works with any Bluetooth device, but there’s a distinctly Apple-like design sensitivity about its packaging. It comes in a long, white box that’s strikingly reminiscent of the sturdy coffer for the Apple Watch Series 3, and the sleek plastic case itself doubles as a charger for the Tap much as we see with AirPods. I haven’t had enough time to test Kemeny’s claims, but she tells me I can expect around eight hours out of a charge and that the case itself can power the device multiple times. So I guess the question is, would I ever use it to write an entire article on deadline? I doubt it. Even at its fastest, the speed appears comparable to my dad’s hunting and pecking on a traditional keyboard. It’s much faster than tapping out Morse Code, sure, but it even falls short of scribbling some notes out by hand (or at least when you write as fast as I do). Emails or text messages, though? Quick messages sent through chat channels in games played with a traditional gamepad? That’s where it could shine. But when I’m thinking alone on the bed at night, staring at the ceiling, listening to some of my best sentences go through my head and fearful I’ll lose them if I rush to the desk? That’s when I think I’ll find Tap the most appealing. Just my hand at my side, taptaptapping out words on the comforter under my fingers, and me having confidence that my words will come out fully formed on my iPhone or iPad when I look at them later. I tried it last night, and it worked well enough after barely two hours of training. I don’t think Tap will change the world. But for some of us – be we blind, gamers, or fussy writers struggling with imposter syndrome –i t will change some our routines for the better. And perhaps that’s all it needs to do.